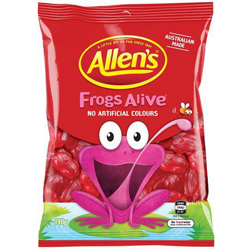 A chewy frog shaped lolly that is red and raspberry berry flavoured. These friendly little characters have a delicious full flavour and are 99% fat free. Frog’s Alive are distributed on mass during schoolies and leavers festivals on the Gold Coast and serve as a great ice breaker. Glucose Syrup (Wheat or Corn), Cane Sugar, Thickener (Dextrin Roasted Starch, Acid treated Starch or Starch acetate) (Wheat), Gelatine, Food Acid (Citric), Colour (Carminic Acid), Flavour. Love these frogs! I can't get enough of them and I wish they were available more easily! Buy these frogs!! They are AMAZING! I'm soooo addicted. Similar great taste to redskins but even better. A must try!